We hold regular events for paid subscribers as well as occasional free events for everyone. This guide will walk you through the registration process and how to participate in each event. Please note the ESEA client must be running whilst you play your ESEA event matches so please make sure you have tested it in advance of the event. For events where a subscription is not required Premium will be added to your account before the event is set to start in order for you to test your client. Make sure you select the right region before registering for an event. When signing up, make sure you select to "join a team" if your teammate has created one. If you are creating the team for others to join, please remember your team password as you will need to share it with your teammates for them to join your roster when they register for the event. All players/coaches/stand-ins must be registered to your roster BEFORE registration closes. You cannot add ANYONE to your roster once registration closes so we would strongly recommend having reliable back up players on your roster just in case of any technical/personal issues. Each player must individually register by logging into the ESEA website and registering for that particular event. Teams cannot register using a scrim/league team for an individual event. All of our events are ran through our event Discord Group chat which you can join below. It is a requirement for one member of each team to join the chat in order to get live support from our event moderators. We are no longer using the ESEA Steam group chat for support. Once you are in the Discord Chat channel, you are almost good to go. Announcements will be made in the #announcements channel for anything regarding the event. Users can receive support via the #support channel. Please join our discord channel by clicking: here. If you need help at any stage of the event please contact an admin by typing "-new" in the #support channel. This will open a private conversation between you and our administrators. Please do not private message any one admin as this system helps us improve the overall workflow of the event. 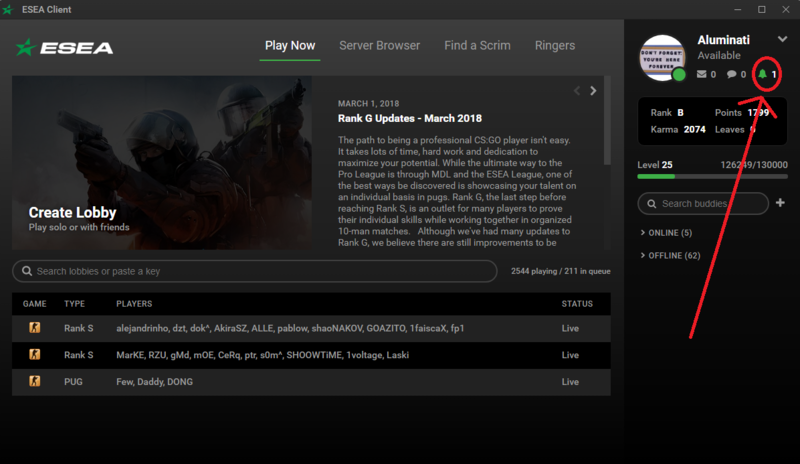 At the time of a live event please do not make a support ticket on the ESEA website relating to any urgent event issue as support is provided in real time via the discord instead of the support ticket system on the website. Please note ONE player is required to check in via the ESEA website during the check-in phase of the event. The time for when check-in opens and closes will be displayed by going to "More information" on the event page. Once check-in opens then one player will need to click on "check-in" which will be displayed visibly once check-in opens. You will be shown a visible checkbox indicating that you have checked in until check-in closes and the event is ready to go. If you have any doubts about where to check in please contact an admin as soon as possible as teams that do not check in will not be added to the event. At the start time of the event, the bracket will be displayed on the event page where previously you checked in. Please do not ask in the group chat for the bracket as it will be posted in the announcements channel as soon as it is available. Typically in events, the top few teams are seeded and the rest are randomly seeded. There is typically a delay between check-in closing and the event starting in order to attempt to fairly seed the teams. Once the bracket is released matches will begin to be assigned to servers. Please make sure your ESEA client is open. An admin will let you know of the progress of the servers assigning via the #announcements channel. If the average ping difference between teams is >25 then please talk to your opponents in the game server and agree upon a new server location. All server locations available are listed here. If you click on the Bell notification symbol then you will see a link to join the server as shown below. If you receive an error when connecting to the server then you should immediately contact an admin via typing "-help" in the #support discord channel. 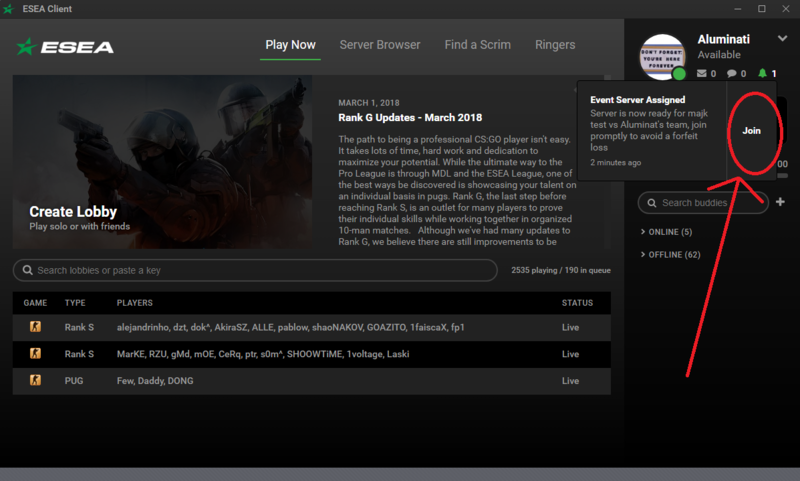 Please let them know your team name and the error that you receive via your CS:GO console when trying to connect to the server. For best of one tournaments, teams will now eliminate back forth one map at a time until the final map is selected and the server changes the map. Players eliminate maps by typing ".ban map_name" for example ".ban de_cache" in order to eliminate the map de_cache from the map pool. Please note that all eliminations are final so please do not joke around, pretend to eliminate one map when you want to eliminate another etc. If your opponent does not have enough players in order to start the match then you can request a forfeit win after a period of time. The period of time will vary depending on the progress and size of the event. An admin will let you know when forfeits for your round are available via the #announcements channel. Please do not ask for a forfeit before the specified time as our admins will be focusing on helping anyone with technical issues get their games started before they start handing out forfeits.